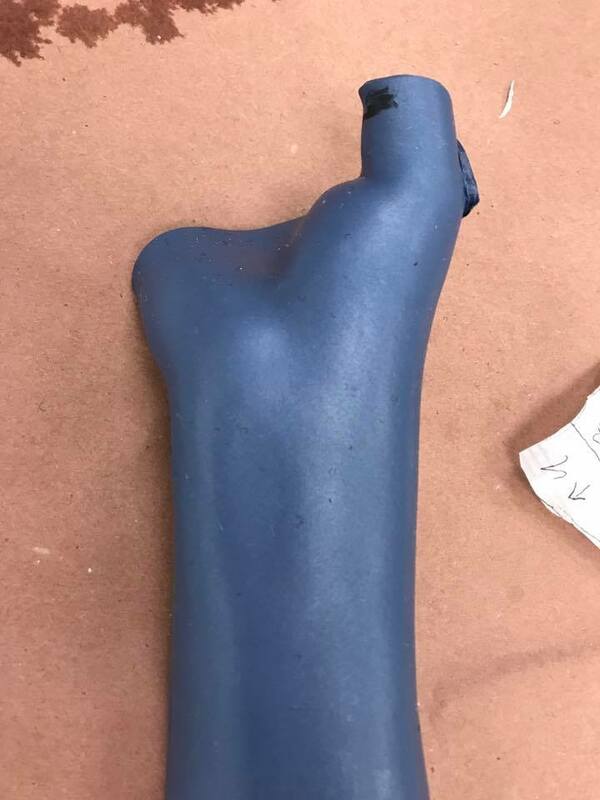 Before moulding any thermoplastic material on your patient’s hand, it is recommended and helpful to begin with a pattern. A pattern allows you to judge the correct amount of material needed for the specific orthosis and helps you to envision the shape and position of the finished product. We begin by placing the patient’s hand palmar side down on a paper towel. 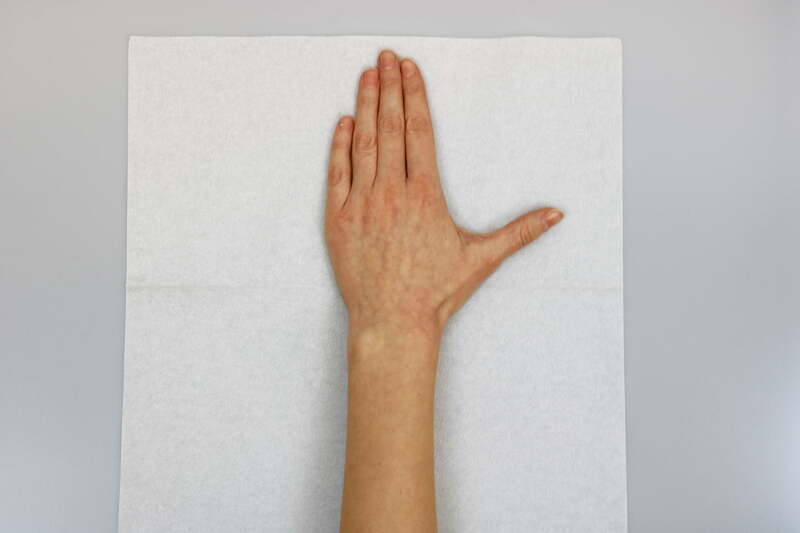 If the patient cannot place their involved hand on the paper towel, you can always draw an outline of the non-involved hand or draw a pattern of your own hand. Adjustments can be made directly on the paper towel prior to cutting out the thermoplastic material. Place the hand in a neutral wrist position, with the fingers close together and the thumb in wide abduction. 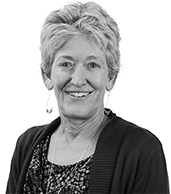 Make sure that your patient’s hand is placed in a neutral wrist position and not radially or ulnarly deviated. You can assess this by checking for straight alignment of the forearm bones with the third metacarpal. Place the fingers close together and the thumb in wide abduction. Draw an outline of the forearm, wrist, thumb and fingers with the pen or marker angled straight down on the paper. Redraw the forearm lines with the pen angled at a 45° angle to the arm. Add about 2,5 cm/1” width to the previously drawn forearm lines. Add 2-3 fingers’ width to the previously drawn forearm lines. These measures ensure that the pattern (and subsequently the orthosis) has enough material to adequately cover 1/2 of the circumference of the forearm. Mark the relevant anatomical landmarks which will aid in determining the proximal and distal edges of the orthosis. Because we are looking at the dorsal hand, we have to imagine where the volar landmarks are placed. At 2/3 the length of the forearm – mark both radial and ulnar sides. The MCP joints of the little and index fingers – The MCP joints of the little and index fingers help to find the distal palmar crease, which is angled to the ulnar side. The first web space – often a thin wedge of thermoplastic material wraps around through this web space to anchor the orthosis. The narrowest part of the wrist – adjust the width of the pattern to accommodate to the narrow wrist or else you will have to do a lot of trimming. The thumb IP joint – thumb orthoses typically allow for unrestricted IP joint motion. The PIP joints of each finger – MCP joint blocking orthoses typically allow unrestricted PIP motion. After drawing the relevant anatomical landmarks, remove the patient’s hand and draw your specific orthosis pattern lines. The pattern itself may come from a picture or from your own idea of which specific joints need to be included in the orthosis. Cut out the pattern and check the fit on the patient’s hand in the desired position. Draw any additional markings on the pattern to indicate necessary adjustments. You can add arrows to increase length or width, or make lines indicating where the pattern needs to be trimmed or shortened. Making adjustments to the pattern will save time and cost when cutting out the thermoplastic material. Once you have checked the paper towel pattern for fit, place it on an appropriately sized piece of thermoplastic material. Draw an outline, but leave enough space for cutting away the marked lines. These should not appear on the finished orthosis. You can use this marker to draw the outline, it will easily wipe off later on. Prior to cutting out the material, determine whether you should preheat it. 3 mm (1/8”) thick material is best cut when slightly warm. 2 mm (1/12”) thick material may need only slight heating for ease of cutting. 1,6 mm (1/16”) thick material is best cut without heating at all. Activate the material and place the patient’s hand in the desired position. 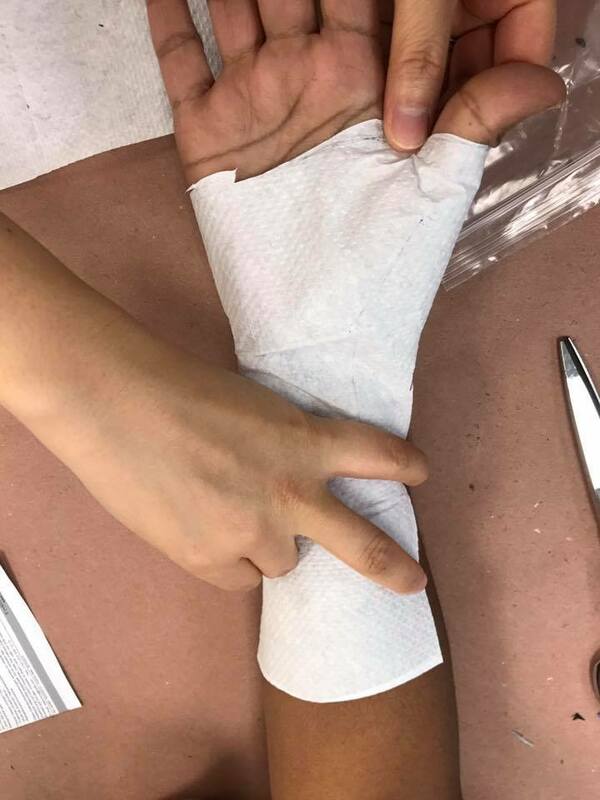 Mould the material to the patient’s hand just like you fitted the paper towel pattern previously. 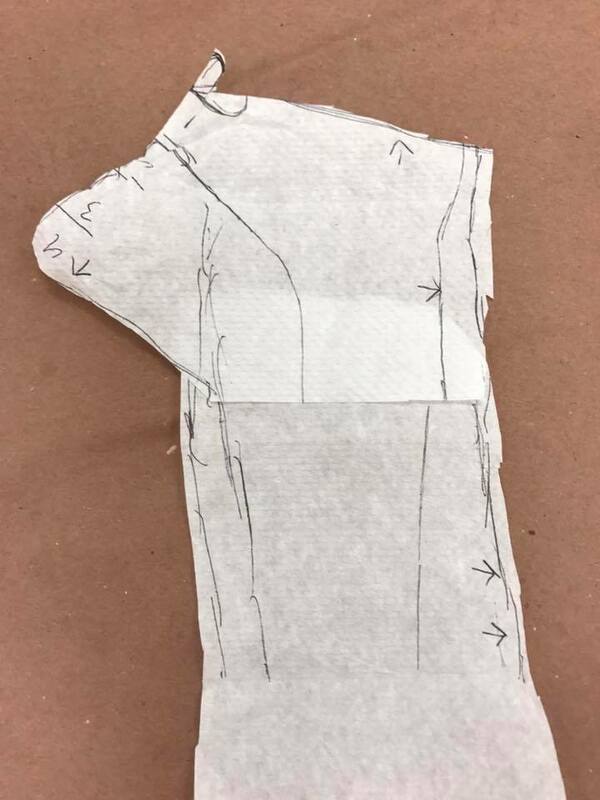 A well-drawn pattern will translate to an orthosis that requires only minimal trimming for a great fit. Congratulations to the new CHT’s!